The Chrysler Cossfire has a classy sporty appeal with its fold-down roof and its exterior good looks. The Crossfire’s engine has been enhanced for better performance and its suspension has been improved to make it fast. Combine all these qualities and you have a quality vehicle that appeals to a very broad audience. One of the most appealing features of the Crossfire is its exterior style. Although not many of them are seen on British roadways, the Crossfire has no problem turning heads on the high street as well. Crossfires that are fitted with the standard V6 engine enjoy a fairly swift car, while Crossfires fitted with the supercharger option add 80bhp and over 100lbs/ft of torque, making the car truly fast and all the more fun to drive. Rapid acceleration is enjoyed in both models. The car’s suspension has also been improved including enhancements made to the ESP system to allow more driver freedom before the system is set to intervene. The car’s roof folds down into the boot and accentuates the car’s physical appearance. The roof takes up a lot of boot space though and will limit storage capabilities while the roof is down. The Crossfire is an expensive purchase. Running and fuel costs will be substantial, as well as substantial insurance premiums. The Crossfire will be a fun yet expensive investment.This Chrysler was not meant to be spacious or practical It is a two-seater convertible with limited boot space when the top is down-with the top up boot space is considerably better. The cabin’s main controls may seem complicated at first but they become easier to use after some practice. The dials and knobs are labeled and easy to find, but the warning lights display can be a little more difficult to see and is often blocked by the steering wheel. The Crossfire’s seats are comfortable enough and provide decent support. The smoother the terrain is the smoother the ride will be. The rougher the terrain is the rougher the ride will be and the more cabin noise and friction that will be experienced. Accessing this vehicle is fairly simple. The doors open widely and allow easy access for most passengers. The opening to the boot is quite small, but access is still easy enough. Parking the crossfire can be difficult with the top up due to limited rear visibility. The car’s side mirrors help however providing good visibility of the car’s exterior. With the top down the vehicle is very easy to park, providing good all around vision and great handling. The Crossfire has great driver appeal. It offers superb performance and a lot of torque. The Crossfire delivers rapid acceleration and great speed. The transmission also offers smooth shifting even when driven hard. The car’s acceleration is matched by the car’s excellent braking system. Although the steering responds quickly it still seems to be lacking. The Crossfire would not make a good family car due to its limited size. It would be a fun second car though and kids would undoubtedly enjoy showing it off to their friends. The Crossfire is not likely to make a good first car. It is an expensive purchase, and even if a new driver could afford to buy it, running costs and insurance would be very high. The car also offers way to much power and speed for a beginner driver. The Crossfire has a good overall quality and build. The cabin has some plastics that don’t seem to match the same standard of quality as the rest of the car. The car’s unusual exterior design is a real attention getter. Despite its US origins, the few Crossfires that are seen on British roads get their fair share of attention. Overall the Crossfire is seen as a great overall driving experience and a fun car to drive. Chrysler realizes the need for a good security system for the Crossfire. The car comes standard with a Thatcham approved alarm system and an immobilizer. The car also has remote central locking and can be set to lock automatically once the car reaches nine mph. The Crossfire hasn’t neglected safety. It comes standard with ABS, ESP, front and side airbags, and seat belt pretensioners. The Crossfire has been equipped with a good level of safety for a car of this type. The car comes standard with a single CD and radio tuner with a 240 watt output. The controls are large and easy to use. The sound quality is good even when the top is down. Seats come in soft leather or suede giving the cabin a quality feel. The cabin is a pleasant mixture of dark colors and flashes of metallic plastics. Other than the cheap feel of the plastics the cabin looks and feels great. The Crossfire has many worthy competitors, but the added performance that the crossfire offers is well worth the price. 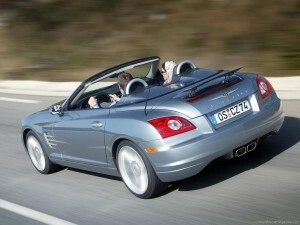 Enthusiastic drivers will appreciate the fun and thrills that the Crossfire offers in abundance.